The bus ride was going well enough at first, but then about twenty minutes in, the driver started leaning left, in oncoming traffic, and moving over on the right only when a car approached. 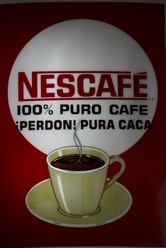 I know I was to embrace the bizarre, but this was preposterous and highly unsettling. Seeing the concerned look on my face, Jocelyne who speaks some Spanish got the attention of the assistant and asked: “hey, why on the wrong side of the road?” The response was that the winds were strong and a gust could carry us off the road. Unsatisfied with this rationale, I wanted to ask: "but, what if a truck comes along just over the hill? Surely that's more likely to carry us off the road?” The assistant ignored us, however, and went back to the driver's cabin shutting the door behind him. This situation was very un-embraceable. 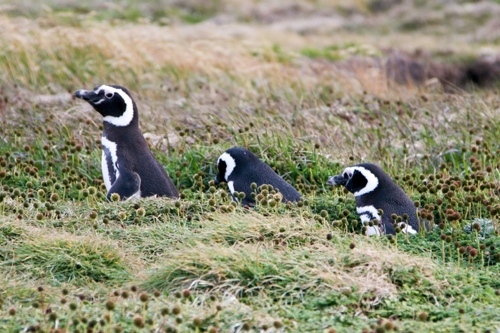 And then about thirty minutes from Punta Arenas something else happened that was bizarre. We pulled over on the side of the road and seconds later a similar bus coming from the direction of Punta Arenas pulled up right in front of ours. Gem announced that this was the bus we would take to Ushuaia the next day, and that it meets the Punta Arenas -bound bus to save passengers time if they want to bypass Punta Arenas and go straight to Ushuaia. But the passenger transfer was extremely dangerous. Since the Ushuaia-bound bus was pulled over on the wrong side of the road, the luggage compartment opened out on the road, and passengers had to dodge cars (and other insane buses) flying at them while retrieving their luggage to hand over to the assistant. Scary business. Somehow, we made it to Punta Arenas unscathed and got dropped off at our hotel: the Diego de Almagro. Unlike the other “four-star” hotels on our trip, this one's rating was deserved and was a delightful change in accommodations. Arriving late in the morning, we had lots of free time to explore the city before our tour to Otway Sound to see the penguins. 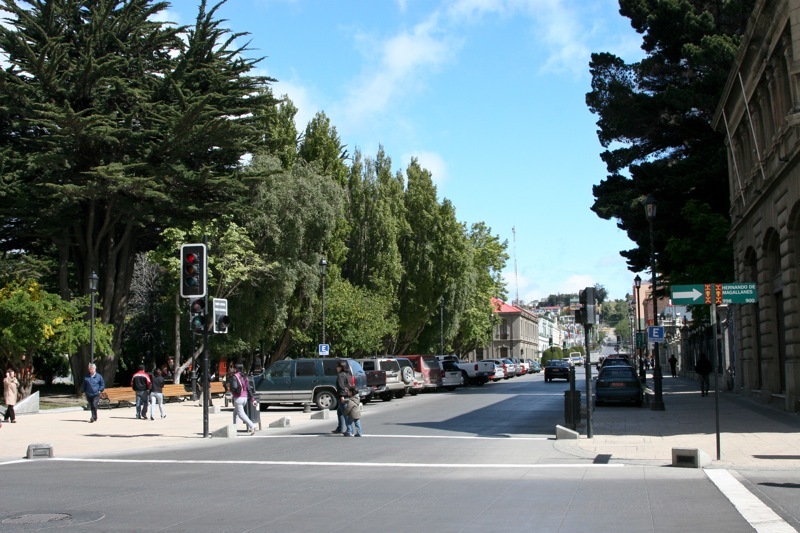 Punta Arenas (“Sandy Point” in English) is a proper city, population: over 100,000. 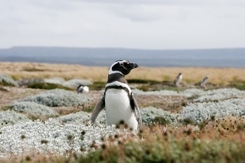 It's located on the Strait of Magellan and is the de facto capital of Patagonian Chile. The locals, however, feel disconnected from their fellow citizens up north, mainly because they are completely isolated by road — to get to Santiago by road, you'd have to go through Argentina, and few Chileans go through the trouble. 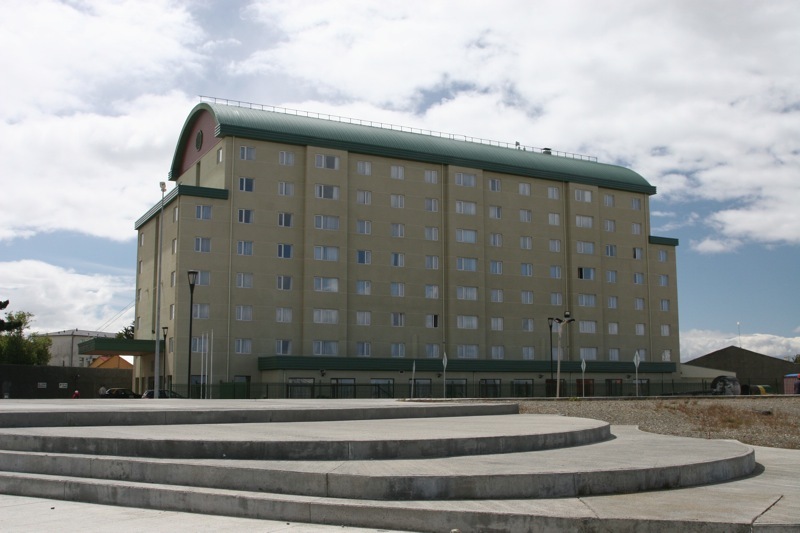 The government provides businesses various incentives to operate here, but the actual people of Punta Arenas feel they are taxed by northern Chile without getting any real benefit in return. Our first order of business was to exchange some money and find food. A few of us found an exchange bureau just a couple of blocks from the hotel and went inside. There were four or five people in front of us, so we waited. A good ten minutes later, just as the last man ahead of us took his Chilean pesos, and it was our turn, the teller put up a CLOSED sign and told us to come back later as she had to count some cash. Embrace the bizarre. This was too much embracing to do on an empty stomach, so we decided to just find a restaurant that accepts credit cards. The place we found was called La Marmita. It had a nice ambiance and was colorfully decorated but overly so. The owner was probably a compulsive hoarder. 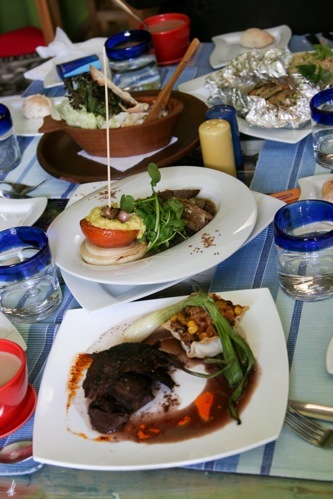 To try a wider variety of dishes, we shared the lamb roast, guanaco roast, ceviche, and the merluza. As I mentioned before, the guanaco was not terribly good — somewhat gamey and chewy. The ceviche is the Chilean version of sushi: fresh raw fish dowsed in lime and chilli peppers. Not much of a sushi fan, I didn't try it, but the others gave it high marks. As for the merluza, it just didn't stack up to Angelicas' and the lamb was ordinary. 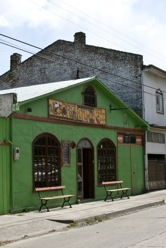 The Hotel Diego de Amagro is an accurately rated 4-star hotel. A monument to Magellan is a common attraction along Hernando de Magellanes Street. Later that afternoon, our local tour guide, Paula, arrived with a minibus to take us to Otway Sound, about an hour's drive from Punta Arenas, and give us a tour of the penguin colony there. Just before we left town, we passed the cemetery, which Paula claimed was the best in South America. Thinking back to the Recoleta Cemetery in Buenos Aires, I couldn't imagine how much more outlandish this one could be. Evidently, both Chileans and Argentinians take the afterlife very seriously. 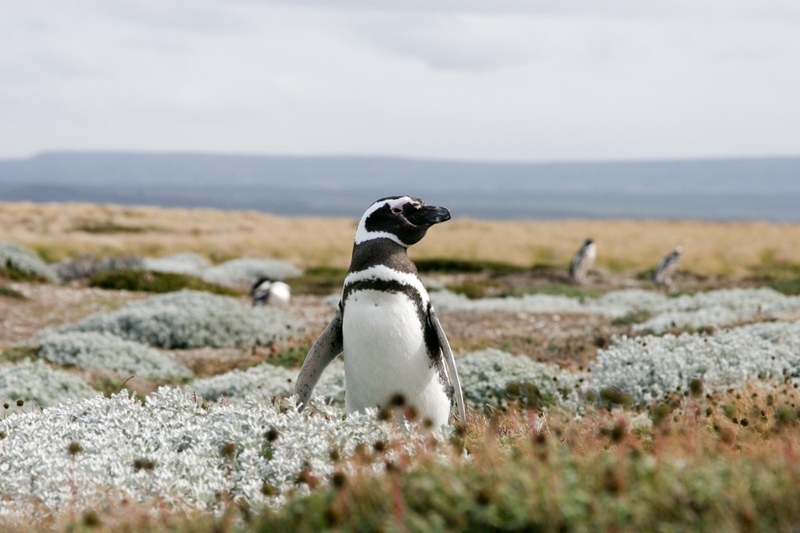 The penguin colony sits on private land and lets visitors get within feet of the birds. There are also various observation decks for a better view and even a cafeteria serving hot beverages that come in handy after all that observing in the biting wind. 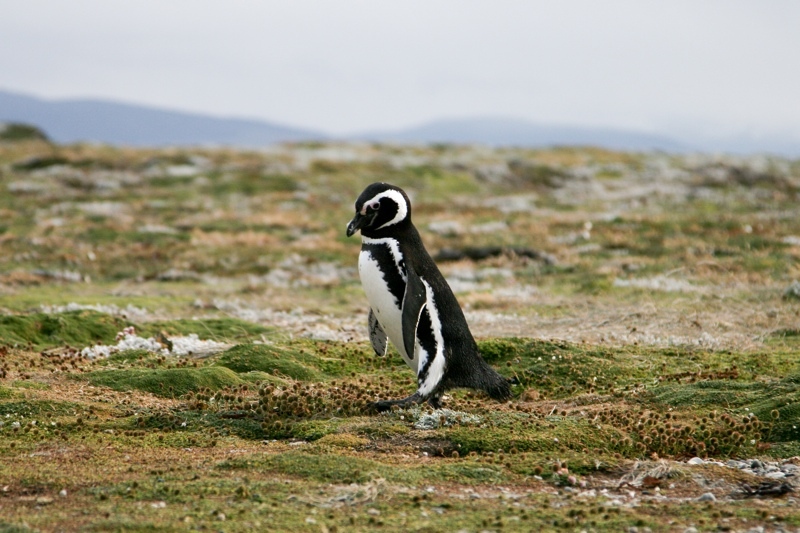 The penguins are of the Magellanic variety, which means they only stand 2ft tall. 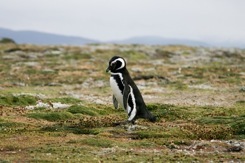 They mostly hang out at the beach, which is inaccessible to visitors, but waddle to land to check up on their eggs. When they do make that trip, they do so single file and surreptitiously, resembling the penguins in the movie Madagascar. When we were visiting, towards the end of November, is when the chicks start hatching, so we must have seen the parents at their busiest time. In January and February, the young ones change their feathers and start to swim. By the end of April, the whole colony takes off on vacation to Brazil and various islands in the Atlantic. The only unfortunate aspect of the reserve is that it seems dangerously close to a coal mine and its harbor. 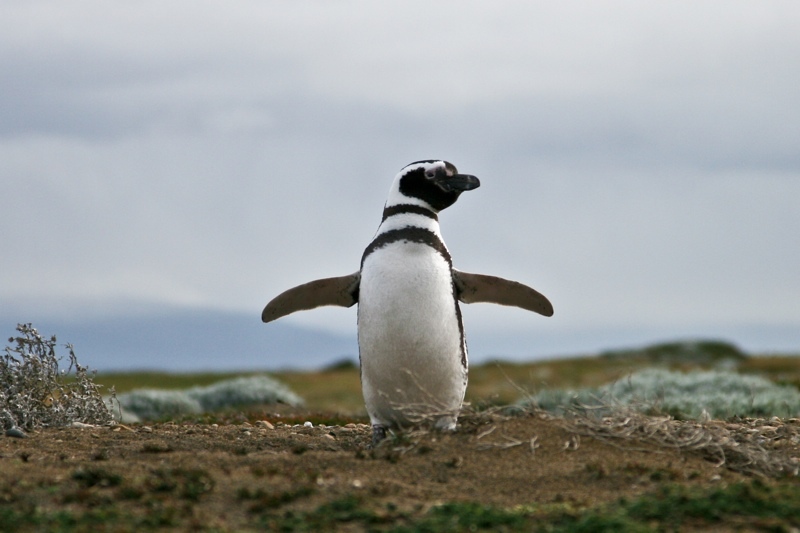 Paula also pointed out that there is another colony of Magellanic penguins on Magdalena Island, just off the coast that has been designated a national nature reserve and is managed by a government agency but that it wasn't open to visitors in November. When we returned to Punta Arenas in the evening, we ate at a seafood restaurant that had the potential to be very good but ended up being a disappointment. To fix our frustrations, some of us went over to the sky bar at the local hotel casino, which was trendy and offered great 360-degree views of Punta Arenas. The view had such a strong influence on the sky bar design from an architectural perspective, that the lavatory stalls had floor-to-ceiling windows. Yes, you get a good view of Punta Arenas, but Punta Arenas gets a good view of you too. I can haz flying lesson?